(HOLLYWOOD, CA) – STAR TREK is getting a 21st century makeover. 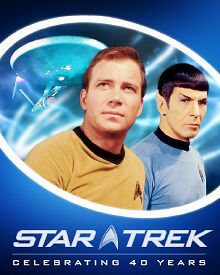 CBS Paramount Domestic Television is releasing digitally remastered episodes of the iconic 1960s sci-fi series, with all new special effects and music, to celebrate the groundbreaking series’ 40th anniversary, it was announced today by John Nogawski, president of CBS Paramount Domestic Television. • Space ship exteriors – The space ship Enterprise, as well as other Starships, will be replaced with state of the art CGI-created ships. The new computer-generated Enterprise is based on the exact measurements of the original model, which now rests in the Smithsonian Institution in Washington, D.C.
• Show opening – The Enterprise and planets seen in the main title sequence will be redone, giving them depth and dimension for the first time. • Galaxy shots – All the graphics of the galaxy, so frequently seen through the window on the Enterprise’s bridge, will be redone. • Exteriors – The battle scenes, planets and ships from other cultures (notably the Romulan Bird of Prey and Klingon Battle Cruisers) will be updated. • Background scenes – Some of the iconic, yet flat, matte paintings used as backdrops for the strange, new worlds explored by the Enterprise crew will get a CGI face-lift, adding atmosphere and lighting. The refurbished episodes also feature higher quality sound for the famous opening theme. The original score by Emmy Award-winning composer Alexander Courage, has been re-recorded in state-of-the-art digital stereo audio with an orchestra and a female singer belting out the famous vocals. A digitally remastered version of William Shatner’s classic original recording of the 38-word “Space, the final frontier…” monologue continues to open each episode.